I’ve recently been re-listening to and rating my entire music collection. In previous versions of iOS rating songs was a hassle — you would have to tap the icon in the upper-right to flip the album in order to reveal the song rating input. For several weeks after updating to iOS 7, I continued to rate songs in a similar fashion. But, iOS 7 had the added step of tapping the Rating button from the album list view before you were able to input your rating for the song. But now, there’s an easier way. 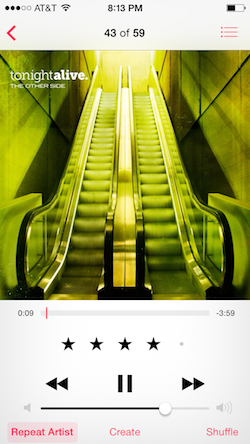 From the Now Playing screen simply tap on the name of the song and five dots will appear in the name’s place allowing you to rate the song. This has made my song rating endeavors much more efficient.